Nyaliga community find power and water solutions to get them closer to living on country and keeping alive their vision for the future and connection to culture. The Nyaliga Aboriginal Corporation has aspirations for its home country. The Nyaliga community is currently focused on Karunjie, which was historically a cattle station in Western Australia. Viable power and water solutions needed to be identified so that the land could be divested back to Nyaliga from the Indigenous Land Corporation. This enables Nyaliga to move closer to realising their vision of a growing, healthy community that is connected to country and culture. Elder Donald Campbell, community leaders Desley and William Gallagher, and the people of Nyaliga engaged engineers through EWB Australia’s pro bono program, EWB Connect, to produce a report outlining how to improve their access to good quality water and increase their power capacity in cost effective and sustainable ways so that they can return to country. Karunjie is a station, 160 kilometres south west of Wyndham, Western Australia. The Nyaliga people have family connections to the Karunjie land that spans tens of thousands of years. After colonisation, a homestead and cattle station was established on Karunjie. In the early 20th century, the station was overseen by Jack Campbell. He was an indigenous man who married a traditional owner and had several children whose families lived and worked on the station in return for food and clothes. Now the land is currently owned by Indigenous Land Corporation (ILC) who are supporting the Nyaliga people to take back ownership and management of their home country. 1. Three community houses near the airstrip on Karunjie, for traditional owners to spend time on country with families. 2. A Ranger Station on Karunjie so that rangers can stay on country and take care of the land. 3. A Meatworks plant to establish an Aboriginal owned enterprise that can supply the region with organic beef and earn an income for the community. 4. A Roadhouse to supply the planned tourism activities in the area. Several projects are already under way to make that vision a reality including a proposed lease of land to a cattle-mustering company and tourism ventures. The Nyaliga Aboriginal Corporation is already responsible for managing Right Way burning in the area and other ranger activities. The main source of water is from the local bore, which has to be boiled before drinking due to a range of contaminants. A common power solution is often to equip the site with a diesel-powered generator. But while generators are relatively inexpensive, diesel costs are high, and the use of fossil fuelled technology carries its own environmental costs. Elder and community leader Donald Campbell, a descendant of Jack Campbell, grew up on the station before going to Wyndham with his family. Community leaders Desley and William Gallagher are also traditional owners of this land. There is a lot of local knowledge and respect for the country. That’s why they are looking for the right answers to their water and power questions. They approached Rachel Lattimore at Community Housing Limited (CHL) to help them find the solutions. At their request, CHL works with local communities to develop their capacity for self-determination. The CHL acts as a facilitator between Aboriginal communities and the organisations, and processes, that can help them achieve their vision. At the same time, an integrated essential services and social enterprise organisation, Utility360 who was engaged with CHL, meet with the Nyaliga Aboriginal Corporation with a view to pilot a project that would provide functional, reliable and safe off-grid drinking water and energy infrastructure. Nyaliga Aboriginal Corporation wanted to ensure that Utility360 was the most viable solution. So they engaged the support of Engineers Without Borders Australia’s program EWB Connect, with the support of both CHL and Utility360. Jack and Simon asked open-ended questions to hear the community’s aspirations. Simon and Jack also attended a Nyaliga board meeting to consult with other key community stakeholders. In the final report, Arup put forward practical options that has resulted in the ILC putting aside funds to install solar panels with battery capacity. As well as representing a significant shift towards a broader acceptance of long-term, sustainable power solutions, it will be a critical step for the Nyaliga people to get back on country. Nyaliga community is currently getting carbon credits for their fire prevention work. Arup has volunteered to help the community find purchasers for their $120,000 worth of credits. This could be real and vital money to support the community and further develop the land. The Nyaliga community is now looking at its options and building a ten-year plan for growth. The people are looking ahead and keeping their broader vision in their sights. Having a partner like Rachel at CHL meant that Jack and Simon learnt how to immerse themselves into the community in a culturally sensitive and appropriate way. Without a community partner like CHL, business partners may find it valuable, indeed EWB Connect would suggest it necessary, to invest in cultural training for their staff. The bore water is currently sitting underneath a cattle yard and before water treatment infrastructure can be installed on-site, the community needs to determine its quality and what treatment is required to make the water safe to drink. This has led to another pro bono project with Arup to collect and test water samples. Project partners are also starting to look at different options, such as surface or spring water. The conversations between the community and the engineers continue. Fortunately, there are many good heads at the table, including the community who know and respect the land. Working together, they can figure out the solutions. 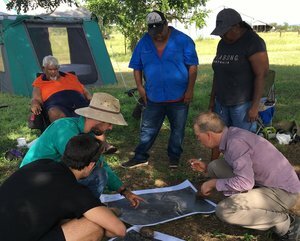 The Nyaliga Aboriginal Corporation are seeking to reconnect with their traditional homelands in order to connect back with their country and culture, and preserve it for future generations. That is why Nyaliga want to create social enterprise opportunities, and establish environmentally sustainable ways to live on and manage their country.